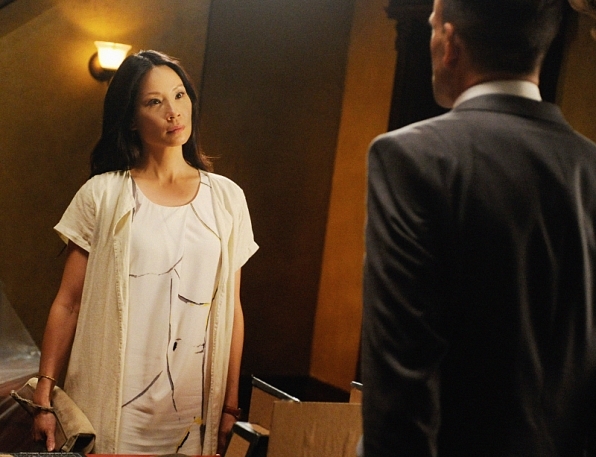 Previously on Elementary: The Grand Experiment. I am so, so glad that this show is back. It’s a fantastic season opener, for so many reasons. Six months after moving out of the Brownstone, Joan has her own investigation business, she’s got clients, she’s still consulting with the NYPD, she’s on Gregson and Marcus’s speed dial. She helped take down a goddamn drug kingpin (running an operation staffed solely by women, by the way). She was an apprentice, and now she’s her own mistress, she’s making just as much of a nuisance of herself as Sherlock ever did, and it’s amazing. Things are about to get even more amazing when she reunites with Sherlock for the first time in those six months since he took the job offer with MI-6, and things are, to say the least… incendiary. Because Sherlock’s been bloody well fired from MI-6 for… well, doing what he does, and now he’s back in New York, wanting to get back to consulting with the police. Captain Gregson won’t hear of it, however, unless Watson gives her permission. After the key witness to the trial is murdered on her way, it’s another two months before Sherlock turns up on her doorstep (figuratively speaking), a new protégée in tow — a young woman named Kitty. The thing is, things haven’t been as well between them as Joan had hoped when she made the announcement that she was moving out. She didn’t want to leave Sherlock, she just wanted a place of her own. She realised their arrangement wasn’t entirely healthy for either of them anymore; but it was never her intention to sour things between them. She wanted to remain his friend — and then, things happened with Mycroft and MI-6 and Sherlock took it hard, and now she pretends she doesn’t care he’s back. It stings that he’s got a new apprentice, despite her protestations. I mean, yes, Joan doesn’t need training anymore, she’s a detective. But she misses that friendship, their closeness, and she knows — they both know — that they could be amazing partners, training apprentices together. Apparently, he left her a note, eight months ago, with only five sentences. One of them telling her that she doesn’t need him anymore — which may have been true, but Joan never meant it like that. And that note, well, to her it only spelt out Sherlock’s hurt rejection of her; when the idiot was probably only trying to make it easier for her, for the both of them; just as he didn’t go and join MI-6 to spite her, but to help make things with Mycroft right. It’s such a classic case of miscommunication — they never meant to say that they didn’t need each other, never meant to say they meant nothing to each other. But they were so afraid of losing one another that they jumped to conclusions — and now here we are. You can see how much Joan’s refusal to work with him hurts Sherlock. He must have been missing her so bad, and seeing her for the first time in months is a punch in the gut like nothing else. Jonny Lee Miller brings all of Sherlock’s coping mechanisms, his carefully contained physical expression of emotional pain right back as if there’d never been a hiatus at all. With everyone else, Sherlock is contained simply because that’s who he is, but with Watson, he’s contained because he knows that nothing he can physically or verbally express will live up to how much she means to him. Remember that thing where he stormed in after her abduction and then just stood, looking her over but not daring to breach her personal space? That look in his eyes… it’s here now, too. None of that is helping convince Joan to work with you again, Sherlock, because you’re still lying to yourself. Sure, focusing on a new apprentice helped him get through it, and Joan is clearly proud of him for realising that much about himself, for acknowledging that teaching is something he can do, and taking delight in it and using it to heal himself; finding something a lot more stable than drugs to do it. But by reducing Joan’s role in his life to that of an expendable force… it’s not true. And it’s not helping Joan open up to him again. And now, Elana has explicitly threatened Joan — she’d been banking on her being in that elevator with the witness, it’s why one of the bullets missed by a mile. It was meant for Watson. Which, crap, is damn scary, but Joan doesn’t let it deter her. She solves the case. Sherlock figured out how the victims were killed — but Joan figures out how to nail the culprit. The competition between Joan and Kitty is there at the beginning, but it’s also not. The thing is, Sherlock is deluding himself — yes, taking on a new apprentice was a good idea. But he’s still expecting her to be Joan, and she can’t be. Kitty says it herself, he never shut up about Watson even after he recruited her. He’s measuring her against Watson, and he’s a jerk to her in a way he’s never been to Joan, and that’s saying something. He’s disappointed in her, her grumbles at her, and he demands her to do as she’s told — which, he’s conveniently forgetting, Joan never really did either, despite what he’s telling Kitty now. Kitty’s got her own set of skills, motivations, and morals; and although she and Joan come from different backgrounds and have very different personalities, they’ve got one thing in common: it’s not throwing something away. It’s moving towards something. Sherlock opened a new life to Joan, and she’s not about to deny Kitty that opportunity. Joan is at odds with Kitty because being replaced hurts, no matter how grown-up you are about it; and because she missed Sherlock, too, and it’s now clear as day that even if they get past their quarrels, things will never be as they once were. I’m actually certain that they’ll be better, but when a relationship like that has to heal, all you want at first is to go back to the way it was, to something you recognise. Building something new is hard and painful and it’s scary, but if there’s any logic to this universe, Joan and Sherlock will find their way back to each other someday. And Sherlock’s so happy when Joan tells him she’s fine with him working with the NYPD again. They’re still not partners (yet), but she’s there if he needs a fresh pair of eyes, and that delighted smile on his face is the cutest thing ever, because he’s still that excited puppy around her. He knew he’d always find her here. So he came back. I also love that Joan having a boyfriend just… happens on the side. It’s no big deal, she met him as he was looking for a lizard, she liked him, they started dating, they meet up when they’ve got time, end of story. There’s no drawn out plotline, no time being wasted on it. It just happens, because it just happens to be a part of her life, but it doesn’t suddenly change her life now that she’s not single anymore. You know, Sherlock always placed such huge meaning on romance by hating it so much and dismissing it so vocally — perhaps simply because he doesn’t understand it. But Joan doesn’t suddenly do her stuff differently because she’s got a boyfriend, it’s no defining moment in her life. It just is. I love it. Next on Elementary: The Five Orange Pipz. I think that you wrote a great review. Totally agree that they’re both badly hurt, by things they both did when they didn’t in the least mean to hurt each other. The body language, Miller’s especially, in this episode was amazing. Also love that he was wearing “The Isolator.” Kind of says it all, doesn’t it? I also love that Gregson appears to be kinda hurt, too. Seems like that Holmes relationship may also do some evolving this season. Am interested to see them do more with the whole cast. I love the possibilities of Kitty Winter. In the Doyle story, she threw acid on the face of a serial woman abuser, so I imagine that she’s going to turn out to be quite the loose cannon and that the “plans” she and Sherlock had coming to New York at least partly involve her helping to bring down some criminal or other with whom she’s been previously involved. Maybe that won’t happen, but it struck me that the Case of the Illustrious Client was a clear source of inspiration for this episode in more than one way, so I’m expecting to see more influences from it. For example, Watson’s living separately from Holmes when that story takes place. And it also includes Holmes meeting directly with a dangerous criminal mastermind, which clearly influenced the Elementary choice to have Joan do that in their story. Maybe it was my imagination, but I thought that Elspeth had similar looks to the criminal mastermind described in the Illustrious Client, as well. Loved that Joan glanced in the window to see if she was being followed before the single-stick fight, since that technique has come up in at least two previous shows that I remember. Just one more of the many tiny pieces of the Elementary world that they now regularly build into the stories, giving them a more multileveled richness. I must say, though, that it does worry me that the world-building likely makes this a hard series for somebody to come to and really enjoy if they try to simply join it in the third season. Cable shows thrive on being like that, and so have a few landmark broadcast shows, but CBS mysteries, not so much. Hope they can find the audience that appreciates that kind of show, despite the taint of being a procedural on the old folks’ network. Miller’s body language is fantastic — he’s so, so contained when he’s with Watson, it’s like he’s conditioned himself to keep his shoulders drawn back, as if reaching out would mean he can’t trust himself not to hug her, the big dunce. What I’ve been missing a little, aside from, obviously, Joan and Gregson’s reactions, was Marcus. After all, he struck up a tentative friendship with Sherlock after his recovery. I really wanna see more of his reaction to Sherlock’s return next episode. I hadn’t had time yet to do more research into Kitty Winter, but her name definitely rang that bell. The Adventure of the Illustrious Client as a starting point for her definitely suggests that there’s something in her past that she’s both running from and trying to resolve. She’s moving towards something, and whatever she’s trying to achieve, Sherlock will help her, whether he realises it or not. That’ll surely be an issue of potential friction for them, since I’m not certain he knows yet. I’m not sure… I mean, old folks’ network or no, CBS has been broadcasting a few long-running shows that work with extensive world-building, such as Person of Interest and NCIS, and viewers seem content to either catch up or just join and maybe catch up if there’s stuff they wanna know about. For instance, Moriarty hasn’t been mentioned yet, but they usually include just enough exposition whenever such a character crops up again for audiences to get on board like they did in Season 2. NextDoctor Who: the Complete Series 8 Finale.